On Saturday, The Squire had The Godson come over to help him rebuild the lawn cart, so it would be ready to haul leaves, come fall. This morning, he began searching under the workbench for a can of exterior paint he was positive he had stashed away. He ended up dragging out enough stuff to fill the back of the van, and ran it to the dump, rather than put it out for the trash men. Most of it was paint or other unidentifiable “stuff”. I think he went with the approach that if it sloshed it was still good, and if it clunked it needed to be tossed out. So, he finally found his bucket of white paint. 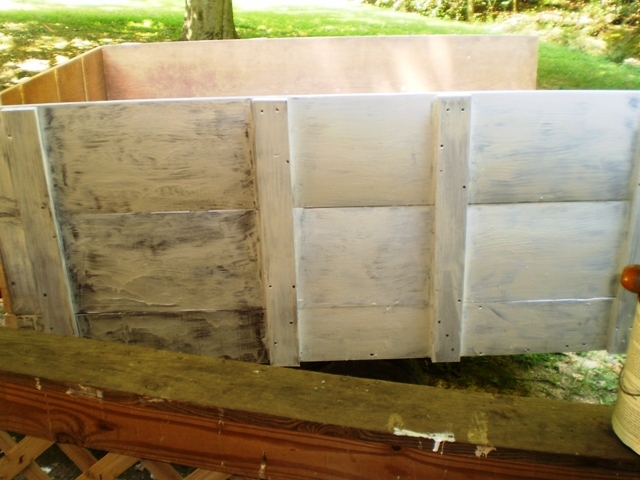 He assures me he gave it a fair amount of shaking before he started to paint his wagon, but the left hand panels illustrate he didn’t shake it as well as he thought. The paint is hanging in globs. Put the lid back on and do the Hokey-Pokey. I came outside while he was dancing madly around on the patio, and just about fell on the ground laughing. Actually, he thought it was pretty funny, too. At any rate, the second part of the job went much more smoothly, as you can see. I just wish I could have gotten a shot of the brush he was using, as the bristles were about as long as his moustache. He was practically painting with the ferrule!